This is a really lofty goal! Do you have a plan for how to reach that high level of transaction volume? The business model is designed to receive 7.5% commission on every transaction. Insertion fees and advertisement fees are expected to also accumulate. The $1 mil in total transaction is projected to take 6 months and the $5 Mil milestone thereafter could be faster given that slope of growth usually accelerates. The key is to sustain it and with effective visibility campaigns, bare bone costs, we’re confident in hitting the milestones. Our business model is ebay. The site will have fixed price and auction transactions. There will be near zero learning curve in how to use the dStors online site. Our buyer and seller base will not be limited to Steem and WLS communities but outside population too. dStors will accept STEEM/SBD/Visa/Paypal. We are finalizing a go to market strategy along with deep reaching marketing efforts. We have a reliance of business expertise that spans 25 years in product launches, sales and business strategies, finance and startups. More to come!! You are the same person that I banned from my photo contests for scamming. Your write up about @dstors tells nothing about dStors other than delegating, which I am sure you will never do because all you are trying to do is scam some upvotes from us. And the fact that you commented on the top comment of this post, only to have visability, proves that I am correct. Glad you have your eye on this @yabapmatt. @kaliju is in South Korea, of all places for it to happen, that would be one of the places. I love the fact that your goal is centered around profit. I think that money and tokens are ultimately methods for measuring the value of products and services. I think you are correct in publishing an ICO after you have been running the store. The best tokens are the ones that work around workable products/services. I look forward to seeing more of this project and will definitely participate. I am now following you. I don’t understand how this is profitable. Isn’t the “profit” just coming from producing tokens when people buy or sell from a store built on the dstors platform? How is that any different than how steem works? PS: I sent you a steemchat! 7.5% comission is quite high. Are you sure you can offer competitive prices both for seller and buyer if the STORS token scheme were to be ignored? I reserve the right to adjust, change and improve anything about @dstors - you obviously haven't read the whitepaper where it talks about rates between 3 to 7.5% depending on various factors. A lot of factors, actually. Only the seller pays, never the buyer. High volume and dollar amount sellers will get discounted fee schedule on a sliding scale. The fee will be collected upon transaction completion. If this is what you call competitive, then I'm happy to tell you that we will wipe the floor with those guys. In short: I'm sure. Not sure if your comment is impression based or data derived. Our 7.5% is data derived from the competitive landscape. Also, very important, please note that Buyers always pay ZERO fees. The fees are all on the seller side. Ebay has $500 Mil per month in profit. That means a total of more than $5 Bil in transactions every month. They can't make $500 mil per month at a capped $50 fee. Look at their cash flow....not possible with a $50 cap on fees. For dStors, fees wouldn't scale of course if it was a single $1 Mil transaction. However, the composition of MOST transactions are expected to be mostly in the range from $125 to $650. In this scale, $1 Mil total transaction made up of the average price items would scale accordingly. But here is the differentiator. On eBay, what do the seller and buyer get after the transaction? Nothing but the transaction completion. dStors will raise the value ceiling by rewarding buyers and sellers with STORS tokens that can be spent for upvotes from dSTORS voting bots on either the Steemit or Whaleshares sites. Or, the STORS token can be sold on the Bitshares exchange for FIAT or BTS or any other cryptocurrency. Or they can hold STORS tokens as convertible options to the ICO tokens. Makes sense. To be fair I only did one little google search. Looks good though! Looking at the charges by the e-commerce giant Amazon, @dstors potential charges seems fair enough. 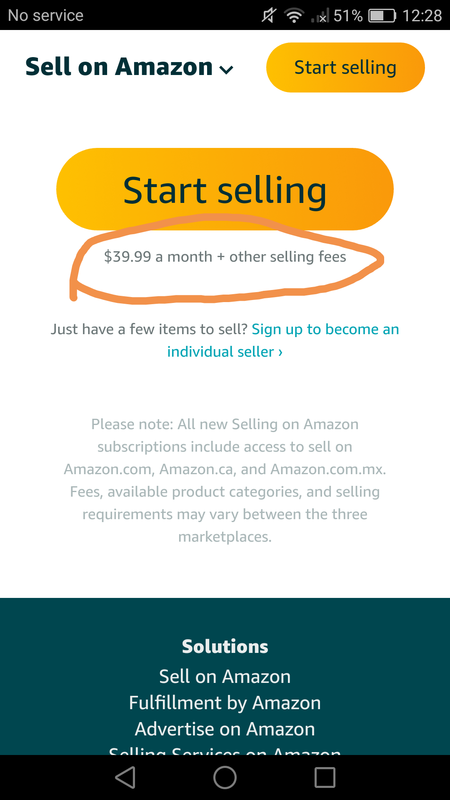 $39.99 a month + other selling fees, which includes referral fee ranges from 6% to 20% of a product selling price, and shipping orders are to be paid by the seller. I'm in for 500. Resteemed. Is it only dstor tokens that we receive for delegation? A once off payment seems a bit cheap for 500sp. I’d prefer to see some ongoing passive income for my support of your project. I love what you are doing, and will most likely become a seller. But I’m looking for long term passive income streams for my SP. Actually, as the White Paper says, STORS payment is renewed every 6 months. So, you'll receive the payment also beginning on month four, 5 and 6 for the first 50% and the remaining 50% will be paid out on 1st day of 7th month. IF you want to delegate for another 6 months, the STORS payment renews. So, yes, it is passive accrual. i appreciate that there will be STEEM/SBD/Visa/Paypal. just the minimum SP delegation might be a challenge for now. Why would you charge someone for listing a product? Why not take your fee on every sale that occurs? Please note that Buyers NEVER pay any fees. ALL fees are paid by sellers. The first 20 items or so will be free; but beyond that will have moderate fees. The first 3 images of the product will be free, but beyond that, insertion fees will apply. Yes like other online stores do, charge a certain amount of fee from the sellers on their sales. I just delegated 500. I want to see a marketplace of Steem where we can buy and trade around the world. Thanks for the support @mineopoly! True Seoulian. I like the concept of Profit and that's how most of the Businesses in the world works. This was lacking here at steemblock chain and if this concept drills down here as well then it's going to be a win win situation for everyone of us. Best wishes. Mmmm...no plankton participation encouraged here it seems..? Good luck anyhow fellows! Trading real goods and services in a decentralized market environment (open agor) using cryptos is where we need to get, so go @dStors, go! Plankton can earn just by using dstors as you would amazon or ebay. Buy or Sell and you get rewards you can use for powerful upvotes here on your blog. Everyone wins on every transaction, and then even more so if you use steemit because of the votes. I'll be visiting soon as there is a gap - trading real stuff with cryptos is what I am on about! Thanks...will have a closer look! Isn't steemit decentralised? If so, then how can they now turn it to a profit making Inc since profit relies solely on we who upvote or do not upvote? Just asking. @dstors I delegated 150 SP. Will I receive any benefits, tokens for that or not since it's below 500 SP? While we appreciate the support, it is a minimum 500 SP delegation to receive any STORS tokens. Unfortunately I will have to take back my delegation because of that. No problem, come back when we launch and you're ready to use the platform! Please read my response to @yabapmatt above. @dallas27, profit is capitalism. IThe business with the best edge over competition will survive. dStors believes that eCommerce has reached the limits of potential. By amalgamating Crypto token based rewards system while at the same time accepting STEEM/SBD as payments along with USD and Paypal...we believe we have something...a potential edge. So, if I wanted to play and have skin in the game...I'd go earn some SP through posts or go buy some SP. I think the new RC system underlies this reasoning too. Can you share how you would launch an ICO for @dstors? i.e. would it be a Steem-based SMT or a coin on it's own blockchain? I am not that well versed on ICO's so some additional information and insight would be appreciated. We haven't decide that yet. We may even go IPO and become a publicly traded company; instead of an ICO. Ah okay @dstors thank you for clarifying. The only disadvantage I can see about becoming a publically held company is that the dedication of @dstors might get tilted too far towards the shareholders and away from your user base - I think that is kind of what happened with the FAANG stocks. Yes, you're absolutely right. It much depends on the culture of the company and the leadership. dStors will strive to be most responsible to the community. That's true @dstors there might also be a way to cement your current leadership in the company before going public - I read somewhere about Mark Zuckerberg and the Google founders wanting to do that by creating special shares that were worth 51% of the shareholder votes (I am pretty sure that Google accomplished this). Some people might not like that idea but if a public company is ran by the day-to-day whim of the shareholders, the company will tend to focus on short-term gains like share buy-backs instead of healthy growth and investments. Yeah, generally to retain control a company might create stock A and stock B, and one is only held by those holding onto the 51%. There are various setups to this, but that's a common one for sure. Thanks @crypto-bot and yeah, that is part of what I am talking about. But I remember Mark Zuckerberg calling for a vote that would give him a cemented hold on the company long after he no longer had 51% in his possession. At least that is what I understand at the time when I was reading the news articles. I think the founders of Google did something similar but may have done it from the get-go. You got a 66.73% upvote from @booster courtesy of @dstors!